"Independently Together", the graduate illustrators' show of the School of Creative Arts and Animation at Toronto's Seneca College is on December 12 - 19 at Gallery 1313, 1313 Queen Street West. An opening reception is being held December 13, 7 - 10 p.m. with the graduate artists in attendance. It showcases the outcome of the college's four-semester, two-year illustration diploma, with work in drawing, painting, mixed media, printmaking, sculpture and digital media. A lot of people thought that Rogers Publishing was crazy to try to launch a national sports magazine, says Sportsnet's publisher and editor-in-chief Steve Maich. And it wasn't the easiest time to launch a magazine, in the teeth of a recession two years ago when no Canadian teams got into the second round of the NHL playoffs, he told a session called the Future of Magazines, presented Wednesday in Toronto by Magazines Canada. But the magazine has done much better than people expected, particularly on the advertising side. Sports are special and Canadians are passionate about them. "Our job is to create a magazine about sports that is directed to that passion; if we don't, then we're not doing our job." People want to work in the magazine medium -- the number of talented people who left secure gigs to join Sportsnet "should be very encouraging to us". The future is in multiplatforms and being inside the Rogers Publishing group gave the venture huge advantages, from linking with other media (radio and TV) to having some leverage with Canada Post. Print was really the final piece of a puzzle where Rogers had all the other pieces. Magazines are still a great business, he said. "We're investing millions of dollars because that is an important part of the puzzle." It's a mistake to assume that readers won't appreciate comprehensive coverage. They will read long and short items if they are high enough quality. "The thing that kills us isn't when a reader says they don't have time to read, it's when the reader flips through in 10 minutes and thinks they're done." The old ways of circulation are not the best ways for a magazine of this type. "Our industry tends to build circ by going to known magazine readers. That approach is not going to get us where we want to go. Sports fans are not on that list. We've got to strike partnerships, a whole different way of reaching them." The old audit rules, he says, just don't make allowance for these new ways of reaching -- and measuring -- readership. The future is paid. "The onus is on us to make products worth paying for." The magazine considers itself a brand that is about telling sports stories. "We do a great job of promoting other people's brands, but we've got to support our own brand." Instead, This Magazine went abstract, pushing the very boundaries of culture, how we perceive it, and how we define it—as if the things we classified as culture and its matters were accepted on the loosest possible conditions. That means stories on masturbation (or lack thereof), video games that make you smarter, lingerie football, burlesque “flesh” mobs, vegetarianism, and more. If you live in Winnipeg and are messy and disorganized, the Manitoba Editors Association is offering a talk on Wednesday December 5 6:00 to 8:00 p.m. Professional organizer Susan Macaulay of Clarity over Clutter will be talking about time management at the Free Press Cafe, 237 McDermot Ave. The question she'll be answering is "Are you running your life or is your life running you?" Free to members, $10 to others, cash bar. They'd like an RSVP to make sure there are enough appetizers. Universus Media Group,which created the first magazine, website and enewsletter solely focused on Canada's automotive dealers for the Canadian Automobile Dealers Association have just launched a new, free headline news service called CADA Monitor. Universus is a custom and contract publisher and, among other things, publishes Club Toyota. If there’s such a thing as an “it” dog, this year’s is the Ganaraskan. They’re bred in Port Hope—a mix of schnauzer, poodle, cocker spaniel and bichon frisé—to be the best of each breed, but infinitely less precious (check out Floyd). They’re smart, they don’t shed, and they’re preposterously cuddly. And the secret is out—Toronto’s dog parks, once the domain of labra­doodles and wheatons, are teeming with them. "Anyone who thinks that a puppy is a suitable Christmas present is more caught up in the fanatsy of life as a “Kodak” moment than the reality of what it is like to introduce a pup, who has just left the security of the only home it has known, into the sheer mayhem of a home during the holidays. Promoting a mixed breed designer dog as the next “big thing” is simply irresponsible. Cute isn’t good enough – what about the genetic issues associated with throwing together four breeds who all have their own issues? Eye Hip and elbow clearances are not enough. Coal in your stocking Toronto Life – and your name at the top of the naughty list for thinking this was a good idea." "Just awful !! What were you thinking !!!!" Print magazines that convert to digital-only will be required by the Alliance for Audited Media (AAM -- the new name for the Audit Bureau of Circulations) to give subscribers the option to a) receive the digital sub, b) convert to another print publication or c) receive a refund for the remainder of the subscription. Magazines may also offer incentives such as merchandise to convert print subscribers to digital. The AAM is also looking to toughen up circulation-reporting requirements for publishers. In response to pressure from media buyers, the AAM board agreed to require U.S. magazines with circulations over 250,000 to provide issue-by-issue circulation data to the AAM's Rapid Report. The Rapid Report has been a voluntary service since it was introduced in 2006, and participation has been uneven. Some publishers take several months to report data or don’t provide data for every issue. "Media buyers on our board have been pushing for” the requirement, Lulofs said, adding that “the board recognizes the need to keep moving forward, and the availability of timely data is certainly a requirement." The Canadian division is taking a watching brief on the U.S. Rapid Report model and has not yet implemented it for Canadian magazine members. Re-elected for a two-year term on the AAM North American board were: Sunni Boot of ZenithOptimedia, representing Canadian advertising agencies (and now chair of the AAM); Gordon Fisher, Postmedia, representing Canadian newspapers. Sheila Stoneham of Rogers Communications Inc. was elected vice-chair of the AAM board. Dave Zinczenko, who built his reputation on six-pack abs and shirtless cover models, is leaving Men's Health and stepping down as editorial director of Rodale's Women's Health, Prevention and Organic Gardening and general manager of Rodale Books. According to a story in MediaDailyNews, he's going into partnership with the departing publisher of Rodale Books, Stephen Perrine to start up a new business. “You’ll live in West Edmonton Mall for three days and document the experience of going about your daily business within the confines of the mall. “You can meet people there, you can do everything you’d normally do, but the only stipulation is that you can’t leave." Mouallem is a writer and rapper, and the former associate editor of Avenue. Readers can follow his excellent adventure on Twitter @omar_aok. The well-known Toronto photographer Arnaud Maggs, who did a lot of magazine portrait work in the 1970s and early 1980s before turning to more abstract and far-reaching art, has died at 86. This year he was given a major retrospective of his work at the National Gallery in Ottawa and won the $50,000 Scotiabank Photography Prize; according to a story by Martin Knelman in the Toronto Star, there will be a solo Maggs exhibit at the 2013 edition of the Contact photography festival and a book published of his images. Maggs was a graphic designer and commercial fashion photographer before moving into more editorial magazine work. "Maggs achieved popularity and acclaim for his signature portrait series, in which multiple images of a famous subject — such as artist Joseph Beuys and critic Northrop Frye — were presented in unsmiling, grid-like arrangements." Jennifer Reynolds, the editor of Canadian Family (St. Joseph Media) for the past six years, has moved companies and gone uptown to become editor-in-chief of Canadian Living magazine (TC Media), one of the largest women's magazines in the country. Her job will be to renovate and re-launch Canadian Living this spring. It is a big step up, moving from a magazine with a measured print audience of 958,000 to one with 3.8 million. Reynolds succeeds Susan Antonacci, who was recently named director brand development for consumer publishing at TC Media. “This is an exciting time for Canadian Living as we look to invigorate the brand in 2013 with some highly anticipated new initiatives and an extensive redesign of the magazine across all platforms,” commented Lynn Chambers, Vice President and Group Publisher at TC Media in a release. Reynolds was named editor of the year by the Professional Writers Association of Canada last June. Magazines across the country are being approached by the Professional Writers Association of Canada (PWAC) with a no-risk free trial offer of a new web service that, among other things, allows magazines to manage their relationship with freelance writers. 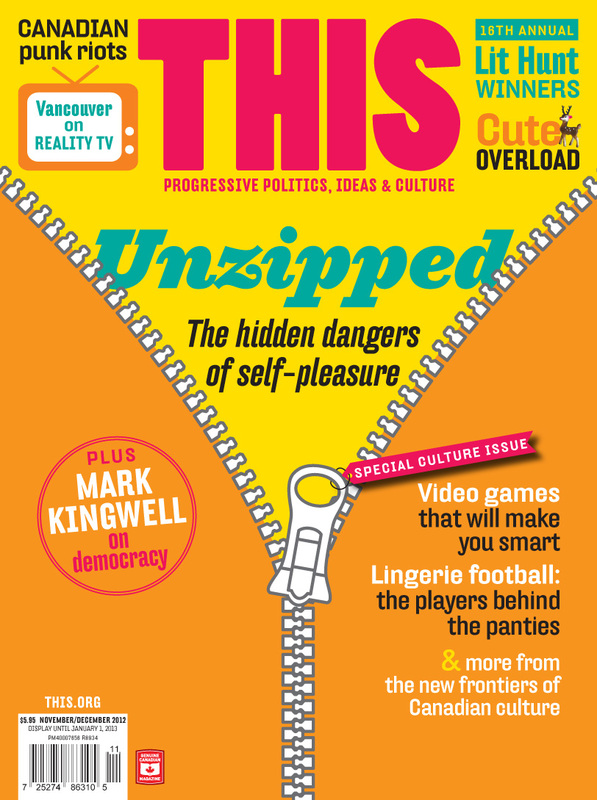 The new, subscription-based service writers.ca, is free from now to Valentine's Day and is initially being offered to member titles of Magazines Canada, one of four partners in the PWAC venture (the others being the Canadian Society of Magazine Editors, the National Magazine Awards, Access Copyright). PWAC has always had a searchable database but this site -- created with support from the Canada Periodical Fund -- is more robust and has new features, including a job board, best practices guide, fee guidelines, contract templates and copyright information. Magazine world view: Digital 1/5th of biz circ; nanny state; sponsored stories? More magazine is being closed by Transcontinental Media, effective the end of the month. The publication, aimed at "grown-up women" and a co-venture with Meredith Corporation, publisher of the U.S. More, has been a popular publication with Canadian readers and a great market for freelancers. While an official release has yet to be made by the company, staff has been told and freelancers were being informed. [Update]A release at the end of the day today said that the December/January issues of MORE and its French-language equivalent Vita will be their last in print and their websites will close over the coming weeks. Some of the sales and editorial staff may be redeployed on other core brands, but there will be job losses. "While the brands resonated well with readers, the challenging economic climate that prevailed for the two years following their launch made it difficult for the young publications to gain the advertising sales needed for long-term success," said the release. “We would like to take this opportunity to sincerely thank our dedicated staff and contributors, our very loyal readers and advertisers, as well as everyone who has made a strong contribution to More and Vita over the years,” said Pierre Marcoux, Senior Vice President, Business and Consumer Solutions, TC Media. An open letter has been published by a group of freelancers for the suspended OpenFile. "As freelancers who put many hours of work into OpenFile’s growth over the past few years, we were all disappointed to hear in late September that it would cease publishing. Freelance journalism isn’t an easy business, and it became a bit tougher when one of the most encouraging prospects for young journalists shut down." The letter, posted on a Tumblr account, contends that several of the freelancers are owed $1,000 or more. Perhaps paradoxically, the five freelancers who signed the letter say they would be glad (willing?) to go back to work for OpenFile provided it settles its bills and gets back on its feet. A campaign to which magazines, their publishers, editors, contributors and readers might all be expected to subscribe -- The National Reading Campaign -- is launching the week of November 12. It's an annual effort, started in 2008, to sustain and grow a reading society in which everyone living in Canada has an equal opportunity to become, enjoy and remain a life-long reader. You'll see what I mean about it being something of a no-brainer for people whose business depends on reading. Starting Tuesday, a series of not-very-demanding launch activities are implemented. For instance, on Tuesday, people are asked to change their Facebook profile picture to one of them reading, and asking all of their social media networks to do the same. On Wednesday, promotion begins on the "What did you read today?” contests. Detailed instructions are provided in the downloadable toolkit. A national publicity push starts on Thursday. And on Friday, participants are asked to change their e-mail signatures to include the question “What did you read today?”, updating it periodically with answers. Consumers prefer favourite print magazines to favourite online sites as a place to look at ads, a study of consumer and marketers' attitudes to online advertising reports. 45% of consumers prefer their favourite magazine and 23% the favourite TV show. Among marketers, the trend to magazines is more pronounced with 55% saying they preferred to look at ads in their favourite magazine. However, only 26 per cent of respondents pay full attention to ads in magazines and newspapers and only 7% to online ads. they will be reviewed one more time, then sent on to the Ministry for further cuts, er, approval. Eventually." Members are being asked to help weather the "funding famine" by writing applications, finding partners and helping with documentation. It will be recalled that MagsBC was thrown into a crisis in February when two funding applications, totalling $151,694, were rejected by the CPF; the agency relented and approved one of the two applications, but still with $25,000 less than it had applied for. The Canada Revenue Agency has issued a warning letter to the magazine Canadian Mennonite for publishing what is considered "partisan political" articles and editorials. The implicit threat is that the magazine could lose its charitable status, whereby it receives operating funding through Mennonite Church Canada and is able to provide tax relief to donors. Maclean's gives a whole new meaning to "advertorial"
Magazine publishers struggling to prevent ads looking like editorial, may want to consider the alternative in the current (Nov 19) issue of Maclean's -- making their editorial look like an ad. One of their contents pages imitates the ad on the facing page (in this case, a promotion for Anyplace TV from parent company Rogers) using the interface of the recently introduced Windows 8 from Microsoft. "I think the switch to mobile is bigger in magnitude than the switch from print to desktop, in terms of what it means for the way people consume content, and it’s happening faster." -- Rob Grimshaw, the managing director of FT.com, telling Media Week that he expects his 124-year-old newspaper will be primarily a mobile experience within three to four years. "Sometimes I think folks in the news industry like to comfort themselves by thinking that somehow we're going from a transition from one point of stasis to another, and then it'll all become cozy again and we can sit back and breathe easy for another 50 years,That's clearly not going to be the case -- things are going to continue to change." -- Richard Gingras, Google's head of news and social products, talking with Knight Fellows about journalism and web ads. From MediaShift. The current issue of University Affairs magazine has as its cover story an article by Albert Braz, "In praise of literature" about the loss of faith in literature by literary scholars and professors. 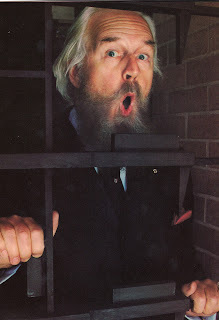 "Whenever one discusses the future of the discipline [he says], it soon becomes apparent that most people feel that if [literature] can be saved at all it will be by embracing some related field, such as film studies, cultural studies or that academic catch-all that goes by the name of theory – anything but literature. In fact, no other term appears to cause more anxiety at departmental meetings than literature itself. Instead of being a source of disciplinary pride, or at least of disciplinary identity, it has become an embarrassment, an anachronism, and we handle it as if it were an explosive device." Braz holds a joint appointment in English and comparative literature at the University of Alberta. He is the author of The False Traitor: Louis Riel in Canadian Culture. Almost as interesting as his article are the comments that sprang up almost immediately it was posted on the UA website yesterday. We reported in September that the OpenFile news site was being suspended pending a reorganization. Now, based on a conversation between CEO Wilf Dinnick and Kelly Toughill for J-source, we know the shape of those changes. The central issue is when, or if, the site will ever be back in business. And if it will ever pay its bills. He said he has been talking with two US media companies about investment. Dinnick said OpenFile said that the site could come back sometime in 2013 and would like to move towards sponsored and custom content as well as selling content to other media -- something that it may be able to do because it believes it can produce content less expensively. He gave, as examples of possible custom content models the kind of things done by the Openforum site run by American Express and Coke 2020 Youtube videos. This is all a very long way from the promise of the venture which was that it would connect readers to their communities. One might wonder whether the price of surviving is worth putting the idea in thrall to corporate sponsors and foreign investors. Dinnick was dubbed the "chief enthusiast" for OpenFile, and was named last year's Newsperson of the Year by J-source. Now, however, he is saying that piloting a startup is like being punched in the face every day. Here's an interesting editorial development technique: the magazine Highline, which celebrates Rocky Mountain culture from its base in Canmore, Alberta, holds a periodic brainstorming party of "friends and influences". According to a post on the Alberta Magazine Publishers (AMPA) blog, five stations are set up, representing publishing, editorial, sales and marketing, website and events/community. The magazine is celebrating its 10th issue by, among other things, increasing its distribution in Calgary and, now, Edmonton. Those involved with the magazine are more than colleagues, they're friends outside of work as well, soaking up the local arts scene or sharing outdoor adventures together, searching for content inspiration and making connections. "Starting this thing almost 5 years ago now, I never could have dreamed that such an amazing, talented group of passionate people would be so willing to jump on board with this vision. I'm constantly humbled by their input, ideas, and dedication to making this magazine the best it can be," says Davison. Nice obituary in today's Globe and Mail about one of Canada's better-known poets, Raymond Souster, who also edited several avant garde literary journals -- Direction, Contact and Combustion -- followed by Contact, which later morphed into Contact Press in 1952, which was a joint venture of Souster, Irving Layton and Louis Dudek. Contact published work by Leonard Cohen, Phyllis Webb, P.K. Page, Michael Ondaatje, Anne Hébert, George Bowering, Milton Acorn and Gwendolyn MacEwen. From the ashes of Harrowsmith Country Living magazine, which was abruptly closed last year by Malcolm Publishing (leaving subscribers in the lurch) has arisen one of its most popular spinoffs -- a revived version of the Harrowsmith Truly Canadian Almanac. According to a story on Masthead, Moongate Publishing, a company created by former Harrowsmith staffer Yolanda Thornton and James Morris, have published 92,000 copies of the 2013 issue of the digest sized book, distributed across Canada. It was edited by former longtime Harrowsmith Country Life editor Tom Cruickshank. A first-ever spring edition is planned; a website and Facebook page for the Almanac have also been launched. "Together with Tom Cruickshank, we have great plans for the Harrowsmith Almanac brand," [noted Thornton]. When asked whether Harrowsmith Country Life will also be brought back, she said, "There is an appetite in the market to revive the magazine and it's something we are exploring." Doug Knight, the president of St. Joseph Media, is interviewed about the state of magazine publishing by CBC News anchor Peter Mansbridge on his program Mansbridge One on One this Saturday at 6:30 p.m. ET, on the CBC News Network. It is repeated on Sunday 12:30 a.m. & 3:30 a.m. ET. It will also be available online in both audio and video. We don't normally run job notices in the blog, but we'll make the exception this time because the position of Literature Officer for the Ontario Arts Council is so critically important to the support of dozens of Canada's literary and cultural magazines. The job has been posted because John Degen is moving to become the executive director of The Writers Union of Canada. The demands of the literature officer job are many, though the salary is not too shabby. But what's vital is getting someone as good as John or his predecessor, Lorraine Filyer, to step up. Deadline is November 23. I am a sucker for before-and-after pictures when it comes to magazine design, though sometimes you wonder whether the after is an improvement. 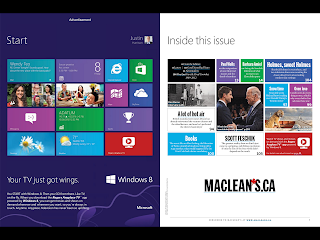 The first, redesigned print issue cover is at right. Below is its predecessor. It's also nice to hear when a magazine's management commits to real change, even if it sometimes scares the willies out of them; such as changing the logo. Lisa Tant, the former longtime editor-in-chief of Flare magazine, a 16-year employee of Rogers and recently (for only four months) publisher of Hello! Canada, is leaving the business to join the upscale retailer Holt Renfrew as its vice-president, fashion editor (a newly created position). According to a story in Marketing magazine, Tant will promote Holt Renfrew on social media, an area she championed during her time at Flare (and which got her into big trouble when she tweeted and broke Lady Gaga's embargo on release of information about her new perfume...no, really), reporting to senior vice-president of sales and marketing Alix Box, and work in partnership with the fashion direction, brand strategy and PR teams.